The weekend arrived and the anticipation of what awaited me at Mustang Maniac was almost too much to bear. Last week was the dash pad and trunk this week unknown. The first plan of action was the trunk which needed re-gapping. Yogi was at the yard working on a car in the panel shop that needed some welding and a floor. I managed to grab Yogi to show me how the final alignment of the trunk is done. He asked for the half inch socket and ratchet and said undo the two bolts that hold the trunk lid on my side. He did likewise, but he put a tiny pinch on his side after he pushed and pulled it a bit, then done similar my side. He lowered the lid and spot on first time. We tightened the bolts fully and the trunk looks fine again. The only difference this time was that the trunk is sitting slightly proud of the rear quarters. The new rubber seal will need to bed down and the trunk will seat back down correctly again. He made it look so easy! Yogi asked me what I was up to and said I didn’t know as Adam was on a guided tour of the yard and cars with some customers. I said I would like to get the front wings sorted so I could get on with the front end. The half hour that he intended to spend with me lasted the best part of three hours of his own time. Thanks for that Yogi. I learned that the alignment is fine until you put the last few bolts in and it pulls the fender the wrong way. So we had to make adjustments, bend a couple of bits back in place and re-hang the right hand wing. The fenders will need splash guards fitted too, but I didn’t get round to those as the aerial had to be fitted first. The aerial hole in the wing is smaller than the standard Mustang one. I am a little paranoid about leaving the aerial up and some scrotum coming along and bending it over. So I went for a fully retractable version. This will help with the car cover when in storage. Trouble is that the base is not as big and in your face as the original aerial bases. It’s something I can change at a later date though. 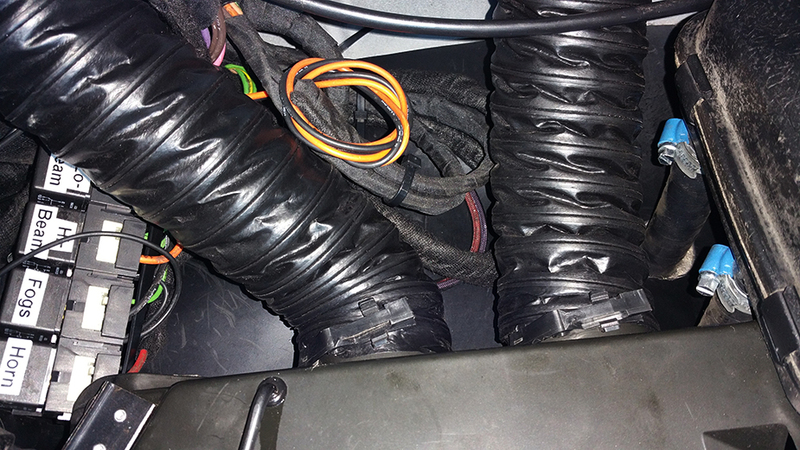 My own job to start with after all the gap work was the plenum. This involves in assuming the “Mustang” position, on your back shoulders twisted forty-five degrees, both arms in front of you, head is supported by the T-shift gear selector that fits nicely in your left ear! Yoga experts need to come and watch the way mechanics have to contort their spines in order to see what is going on under these dash areas. 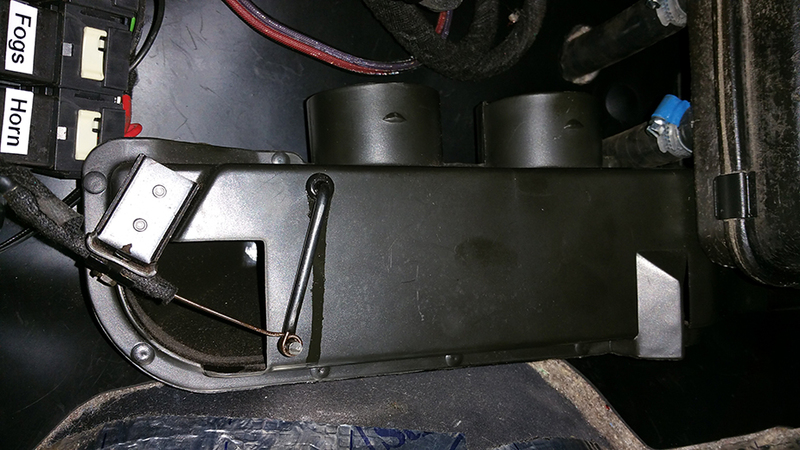 The plastic plenum slips over the metal heater fan box and is held in place by four tiny self tap bolts. Easier said than done as the fire wall padding covers the space where the back bolts should go. The two diffuser outlets at the top have a hose that goes up to the windscreen diffusers that was clipped into the dash last week. These replacement hoses are clever in that they have a clip that snaps shut around the openings. The hoses have to be kept away from the wiper arms. The hoses are tight on the left side up to the dash, but fine on the right hand side. The fitting of the plenum took a stupid amount of time to fit, mainly because it all done by feel as you can’t get your head in there to see. But once fitted they look quite good. Back to the outside now and Adam came down with an arm full of goodies for me. New front grill, front trim and fittings. The grill was a major part I wanted to get on. I worked out that the grill has to be slid into place behind a light bucket then worked carefully around to the centre as the grill sits behind the light fittings. I did it and was quite pleased with myself, up until the point when Adam said I am better of getting the Corral in place first. Dohhhh, I had to take it all back out again. The work requires two hands and concentration not to drag the grill across the paint work. Thus there was not much in the way of photos for the fitting process I’m afraid, there are a few after though of the end result. There are two visible bolts on the top that hold the centre and hood catch, at the bottom there are four self tap screws that go into the trim. A long extension screw driver with a bolt driver is best her with the magnetic holder making things so easy. The Corral itself has been through the wars, it’s a little tarnished but almost as good as the replacements. But, I wanted something very original from the old car, and there is nothing more original than the identity of car, the Mustang Pony in Corral. I might replace it at a later date I’m not sure yet. For now this is a cross over link between the two cars. Bad choice to keep the old or get a new one? The old one certainly doesn’t look out of place. Something missing? Yep the wheels. They were taken of to make it easier to align the fenders gaps up. Here is a clue what I could be doing next week. It could doing the front bumper, or it could be something else, I never really know till I get there. All this doesn’t look much as so much time was done on the smaller adjustments to make it look right. But, I have taken some fancy art shots of the corral, just to make me feel better. 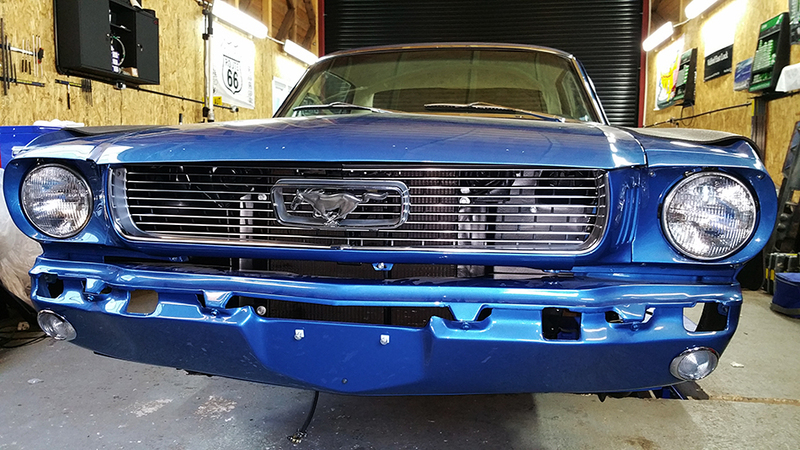 This entry was posted in General and tagged aerial, Corral, diffuser, grill, hoses, Mustang, Mustang Maniac, One man and his Mustang, plenum, Pony. Bookmark the permalink. It looks in pretty good condition in the photos so not sure why you’d need a new one anyway. Always nice to keep the original parts where possible. Thank you. The pony corral had a broken mounting leg and you can see it if you look down from the top. Being cast I had to use the metal repair paste. But for now it will stay. There was a rare optional extra when the car was new which was an illuminated plastic backing behind the corral that ran of the side lights. Scott Drake do something similar with LED behind the pony. That would cover up some of the repaired damage. Got the pony on! Very nice.